SummitNaturalGasCelebratesMilestoneforKennebecValleyProject - Summit Utilities Inc.
On Tuesday, Summit Natural Gas of Maine hosted an event at Thomas College to celebrate the installation of more than 100 miles of pipeline in the Kennebec Valley. Governor Paul R. LePage was part of the large crowd of local community leaders invited by Summit Natural Gas of Maine to celebrate the accomplishment and the economic impact natural gas will have for people in the Kennebec Valley when gas begins flowing later this month. Michael Earnest, president and CEO of Summit Utilities, Inc., the parent company of Summit Natural Gas of Maine announced that the company’s first customers will receive gas service this month. Summit’s planned $350 million natural gas transmission and distribution project is the largest commitment by a natural gas company in the region. To date, the company has completed the 100 miles of pipeline in the Kennebec Valley. The 100 miles is a total of transmission and distribution pipelines that will serve businesses and residents across the Kennebec Valley. “Today’s event marks the success of the hundreds of people that have helped us bring natural gas to Maine that will be the beginning of a whole new way for Mainers in the region to save on their heating costs. As a company, we wanted to say thank you to the several communities that have supported our efforts and have been impacted by our construction. Our team of more than 40 Maine employees is excited that this month we will deliver on our promise to local businesses and residents by bringing natural gas to the Kennebec Valley and beyond,” said Earnest. This year, several construction crews and local contractors worked on Phase One of the company’s plan to install 68 miles of steel main pipeline that is 99 percent complete. Hydro testing is taking place on the pipelines this week and gas service will begin next week for several parts of the region. Additionally, progress has been made on the more than 1,500 miles of distribution lines that will serve businesses and residents in the coming months. As part of the event, Earnest stated that the company has already started working on Phase Two to install more distribution lines in the Kennebec Valley this spring and expand in southern Maine to serve Cumberland, Falmouth and Yarmouth in 2014, an investment of $110 million. More than 1,400 customers have already signed contracts with Summit to save on their heating costs and use a more versatile and environmentally-friendly energy source. Commercial and municipal customers that have signed contracts with Summit include, the City of Augusta, Huhtamaki in Waterville, Inland Hospital in Waterville, Mattson Development, Redington-Fairview General Hospital in Skowhegan, Sappi Fine Paper North America in Skowhegan and UPM Madison. 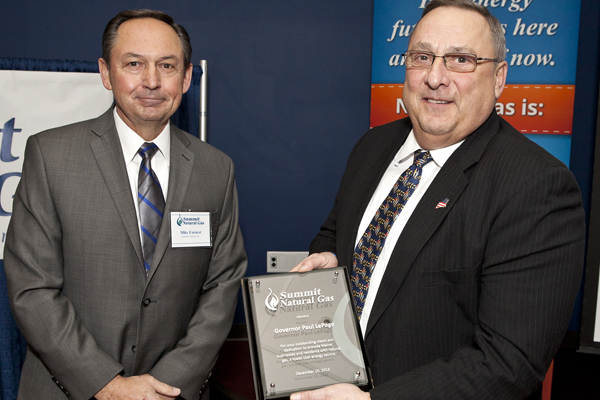 Governor Paul LePage, who has publicly supported the expansion of natural gas in Maine, was presented with a plaque by Summit Natural Gas of Maine to honor his vision to save Maine residents and businesses on their heating costs. In speaking at the event, he praised the scope of Summit’s Kennebec Valley project and the impact it can have on local economies. “The arrival of natural gas in this region will have a significant impact on the economy and allow Maine businesses and residents to save on their heating costs. In addition to the savings to their customers, it is great to see the company has made extraordinary progress and will deliver on their promise and commitment to invest in infrastructure in the state, and at the same time create hundreds of jobs for Maine people,” said Governor LePage. Summit Natural Gas of Maine also unveiled a new video about the company’s project in the Kennebec Valley and provided each person in attendance with a commemorative coaster to mark the historic event. Summit Utilities, Inc., the parent company of Summit Natural Gas of Maine, operates 20 natural gas districts throughout Colorado and Missouri, and specializes in providing natural gas to areas that are either hard to serve or that aren’t being served. These districts represent approximately 40,000 customers, $292 million dollars in assets, 400 miles of high-pressure steel main lines and approximately 1,500 miles of polyethylene gas main lines. In more than 16 years of business, Summit Utilities has never had a major accident despite building pipelines in challenging terrain where other companies chose not to go.